Six Years and Counting: Let’s Share Some Love! Today, NGN turns six years old, and I’m struck by how much things can change in six years—but also by how the really important stuff stays the same. Six years ago, when I sat down to write my first post, I had no idea what was in store for this little hot pink blog. All I knew was that I had things I wanted to say; I had a part of myself—a nerdy, passionate, emotional, enthusiastic part of myself—that I needed to share with the world after hiding her away for a long time. There are a lot of things I never could have imagined about the highs and lows of the last six years—the friends I’d meet, the shows and movies I’d write about, the sleepless nights spent trying to plan the perfect post, the conventions I’d go to, the tears I’d shed when the words wouldn’t come, the actors and creators I’d be so blessed to interact with, the things I’d share about myself—but the most surprising thing of all is that people actually wanted to read what that nerdy, passionate, emotional, enthusiastic person had to say. And people still want to after six years. There is nothing more humbling to me than that. This has been a year of balancing in my life. It’s been a year of trying to find a happy medium between my developing professional life, my own personal wants and needs, and my passion for running this website. And sometimes, that’s meant setting NGN aside and focusing on things like staying on schedule at work and getting a healthy amount of sleep. It’s meant fewer posts, but I truly believe the posts I’ve written this year have gotten back to the true reason I started this website. I wrote them not out of a sense of obligation, fear of letting people down, or desire to please others (all of which naturally happen sometimes in the course of six years as a writer). Instead, I wrote them because I had things I wanted to say, and I wanted to share those things with my fangirl family. I still find myself in awe of the family I’ve created here, and I am so thankful to all of you who have visited NGN during the last six years—from the ones who just stopped by to read one post to the ones who form the backbone of my support system and have been there for me through it all. So many things can change in six years, and so many things have both with NGN and with my life in general. But one thing that has stayed the same is the overwhelming gratitude I feel that so many incredible people have taken the time to read the ramblings of a nerdy girl and have reached out to let that nerdy girl know she’s not alone. I’m grateful for every comment, tweet, Tumblr reblog, and like, and I’m honored to have so many brilliant, funny, and kind people as part of the NGN Family. I don’t know what I did to deserve not only your readership for the past six years, but also your support and friendship, but I hope all of you know that this thing couldn’t work at all—and certainly couldn’t keep working for six years and counting—without you. With all that being said, I want to bring back a little something that we used to do around Christmas here at NGN. That’s right—it’s time for a LOVE POST! Here are the basic instructions as I remember them from my old LiveJournal days: Make a comment on this post with your username (and things like your Twitter or your Tumblr URL if you feel like people might know you better by those identifiers). Then, sit back and let others reply, telling you how much and why they love you. Finally, share the love! Reply to your friends’ comments on this post and tell them how awesome you think they are, or finally tell that one commenter you really respect how insightful you think their thoughts are. The greatest thing about NGN’s development over the last six years has been seeing all the friendships that have formed among all you who’ve stuck around, and I thought there was no better way to honor that and to thank all of you than a post meant to shower you all with love and to encourage you to do that for each other. I’ll kick off the comments to show you how to get things started, and I hope all of you join in so I can personally thank you for being such bright lights in my life. Let’s put some more love into the world today; I can’t think of a better way to celebrate! On April 2, 2012, a 23-year-old editorial assistant sat down at her brand-new MacBook and wrote her first post on a hot pink blog about why she was proud to be a nerd. She had no idea who that post would reach, what post would come after it, or how long she would keep that blog running. All she knew was that she needed to write analytically and enthusiastically about things she loved, and this seemed like the best plan. Five years later, a 28-year-old associate editorial director sat down at her slowly dying MacBook and started writing her 733 post on a hot pink blog about why she’s still proud to be a nerd. So much has changed in the last five years—both at NGN and in my life—but some things will never change. I will always believe that there’s no more fulfilling life than the life of a nerdy girl. I will always be thankful for every comment, like, and view this website gets. And I will always find joy in writing analytically and enthusiastically about the things I love. Every year since NGN was created has been a new adventure, filled with challenges, changes, and lessons to learn—and this year held more challenges, changes, and lessons than any other. A new position at work pushed me professionally in ways I never imagined I would be pushed so early in my career, and that’s led to some changes here at NGN in terms of how much and how often I post. Such a major life change called for me to reevaluate my relationship with what I do here at NGN, and recently, I’ve been reminded that this website and the kind of writing I do here bring me more happiness and fulfillment than almost anything else in my life. It’s good to work hard, but it’s also good to make time for what makes you happy. And even after five years, running this website still makes me happy. Writing posts, interacting with the NGN Family, and reading all of your comments (I may not always reply, but know that I still read and appreciate every single one.) has been a way for me to connect with the best version of myself at a time when it could have been easy for me to lose the voice I started to find on April 2, 2012. I can’t imagine a better, more fulfilling life than the life of a nerdy girl. A lot of things can change in four years. And a lot of things have changed over the last four years—not just for NGN as a site but for me as a person. But my goal from the start has always been to keep NGN moving forward, and I’d like to think I’ve done that—moving forward in the process of becoming not just a better writer but a better version of myself through running this site. When I look back on some of my oldest NGN posts, I’m struck by how much distance I kept between myself and what I was writing about. I was afraid to get too personal—and the secret is, sometimes I still am. It’s scary to be vulnerable, it’s scary to talk about how much something means to you, and it’s scary to talk about yourself through a medium that makes that writing available to anyone who wants to read it and comment on it. In my quest to be as open as I can be in my writing, I’ve discovered that emotional honesty is a double-edged sword. It allows you to form genuine connections with people through your writing, but it also allows people who don’t like a particular thing you’ve written or an opinion you’ve shared to believe they can judge you as a person because of it. There have been plenty of occasions—this year perhaps more than any other—where it’s felt easier to just hide behind a more impersonal approach to writing or to just stop writing altogether. Because writing with honesty and vulnerability is hard. But to quote one of my favorite movies, A League of Their Own: “It’s supposed to be hard…The hard is what makes it great.” And it is great. And part of the reason it’s so great is because it’s scary. Running this site and sharing my writing with all of you has made me feel braver than I could ever have hoped to feel. And this year I’ve felt braver than ever before. 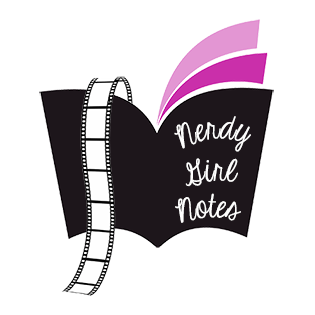 Today is a special day at Nerdy Girl Notes, and it seems very fitting that it should fall on a Fangirl Thursday. It’s NGN’s third birthday/blogiversary/whatever the kids are calling it nowadays. The point is, three years ago today, I picked out my hot pink color scheme, wrote a post about the joys of being a nerdy girl, and NGN was born. NGN has evolved and grown so much since its earliest days, and in the process, I’ve grown so much, too. I started this blog as a way to reconnect with the kind of writing I wanted to do, and somewhere along the way, I also discovered the kind of person I want to be. That’s not something you think about when you write your first blog post, but it’s something I feel thankful for every day—that what started out as a writing exercise turned into a place where I was able to grow as a person not just through my writing, but through interacting with some of the smartest and kindest people I could have ever hoped to meet. This year has been a year of new challenges at NGN. New TV shows were reviewed, new features were started, new lists were made, and new essays were written. I pushed myself as a writer this year not just in the sheer volume of posts I wrote, but in the vulnerability many of them required. And I am forever grateful for all of you who’ve responded with vulnerability and openness of your own. We share something special with one another when we talk about the media we love, and this year was filled with reminders of that belief, which has always been at the heart of everything I write here.